Xia Xia Pets: What are Xia Xia little friends? Like you all already know Xia Xia crabs come wearing nice and colorful shells. Inside each such shell, there is a tiny Xia Xia little friend. The additional shells that sold separately includes not one but almost two tiny collectible creatures. It can be cupcake, alarm clock character and so on. All they little toys can ride on top of crab's shell. They are so cute and high collectible. 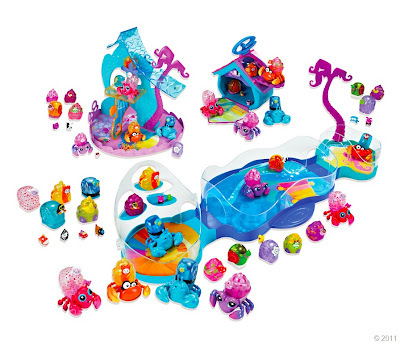 Here I attached the pic of entire Xia Xia world, you can see little tiny toys right next to the crabs.